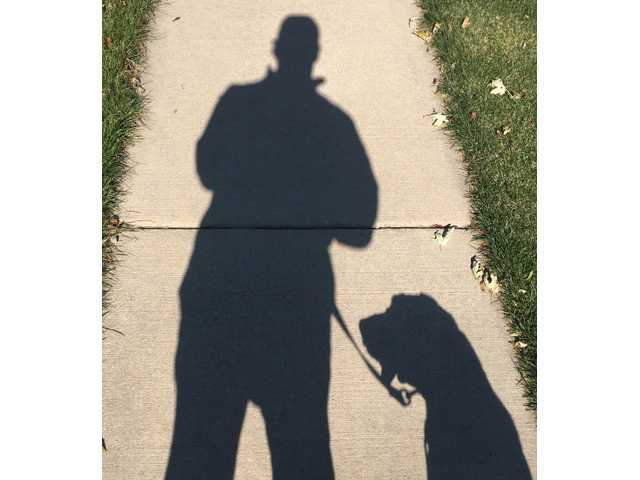 POSTED October 28, 2018 3:04 p.m.
Last Sunday afternoon, I took our dog Charlie for a walk around town. For those people who have seen Renee and I walk Charlie over the years, you have often made the joke that it’s more him walking us, the leash taut as he pulls us along. Charlie loves walks, so much so that whenever we mentioned the word walk, he would get excited and go to the door, waiting for us to take him. It got so bad, we began spelling out the word w-a-l-k, but he learned that and the mere spelling excited him. This walk Sunday was different, however. The leash was not tight as he led me along our normal path. No, the leash just hung there, and we walked side-by-side. We walked together around Winskill, then back to downtown, and then around the other side. We just kept walking and walking, and neither of us wanted to stop walking. I cannot speak for Charlie, but the reason I didn’t want to stop was because it was the last walk we would ever take together…after nine years, the last of which was spent fighting cancer, Charlie went to sleep for the last time after that walk. We had found him in September 2009, walking down the middle of the road as we were going into work. Stopping because I wanted to make sure he wouldn’t get accidentally hit, you could see he had been out there awhile, and was far from home - scars on his face from some sort of tussle, his ribs just pushing through his dull coat. He wore a collar with no tags on it and he collapsed from exhaustion when he jumped into the back seat of my car. I drove around to neighboring farms, and the one person I talked to had told me he had popped up like a month or two previous from out of nowhere. “He’s not causing any harm,” I remember hearing, as he said that when Charlie popped up, his grandchildren would take him for a walk. I didn’t feel that popping in and out of cornfields hoping to find food and water was the best thing for him, so I decided I was going to take him and….well I had no other ideas yet. I called into the office and asked Sandy if I could bring him to her farm until I could figure something out, and she said sure. I was still living in Shullsburg at the time and as we started to make our way to Lancaster, Renee and I started saying names, to see if he would react. When the name Charlie was said, the dog reacted unlike any other time, so you could say that he named himself. I brought him to Sandy’s farm, and put him in a garage with a bucket of water. I came back soon after with some food. Charlie spent one day at the Taylor farm, but as it was going to be the weekend, I decided I wanted to see what Charlie was like - Was he housebroken? Was he a terror? What was his personality? That Friday afternoon, I picked him up and he stayed with us ever since. I soon learned that Charlie probably hadn’t been abandoned, but probably ran off, as he was a bit of a wanderer in his youth, loving to chase after anything. I spent two different occasions taking an hour to find him after he ran off, one time playing with another dog who came in while we were walking. I remember so clearly when I found him, just outside of Shullsburg, going back and forth with the other dog, not knowing which way to go. I saw in his eyes a mix of guilt and gratefulness as he slowly walked up to me, and then hopped into the car to be taken home (I took the other dog to his home). I had placed ads in the paper to see if I could find Charlie’s owner, but thankfully, no one responded. I say thankfully, because if I had found them, I would not had the past nine years with Charlie, and I selfishly am so glad I did. When I was growing up, my parents raised and showed German Shepherds, so I had a lot of dogs pass through my life. To me, I had always thought I would get a German Shepherd someday, when I was in a position to properly take care of a dog. I never thought I would get a floppy-eared, coarse-shorthaired tan stray like Charlie. I may be biased, but he had the most personality I have ever seen from a dog in my life. He was house-trained, but on the rare occasion he had an accident, the moment you came home you knew he had done it because he would look so guilty when you came through the door. For most of our nine years together, he was so healthy that we rarely went to the veterinarian’s office, which the exception of rabies shots. That was until this past spring, when rubbing his face, he yelped like he was hurt. That’s when we saw the lump on his jaw, which turned out to be cancerous - a lump that would ultimately lead to Charlie leaving us. After it was diagnosed, we had a quarter-sized section cut from his jaw, which meant he was never going to be able to chew on a bone again. Charlie had started to recover when he found a raccoon in the back yard, and that tussle caused a break in his jaw. Unfortunately cancer is awful and vigorous. Within a few months, the tumor was back. We went to different consultants to see our options, and the consensus was to take a portion of the jaw. It was something we didn’t want to do, because Charlie just used his mouth for everything, not just food but play, and we worried about the impact on his life. But he went in, and had a large section taken. Unfortunately, the cancer had gotten into the tissue, and came roaring back. With all the time he spent the past year at the veterinarian’s office, what with the surgeries, Charlie did not like going there. I took him there last Monday, at what was suppose to be a checkup, but by the time between when I made the appointment and the actual visit, the cancer had gone from imperceptible to being the size of a tennis ball. He trembled during that visit when we learned there was nothing more that could be done for him. The prognosis was that it could be weeks, it could be months, but it turned out that we would not even have one more week with Charlie. The tumor continued to grow to the point that but the end of the week, he was unable to eat, then he was unable to drink from a dish and swallow. Then it pushed into his mouth so much that he began to bleed from the inside. So we did something we never had done with Charlie - have him drink from the hose outside. He collected the water with his tongue, and you heard some satisfying swallows as he was able to drink. I vowed that I would not bring him to the vet clinic for his final moments because of how nervous and scared he got there - I didn’t want his last moments to be in fear. So I contacted the veterinarian and asked if we could do this somewhere else. She said sure, and we set up the appointment for Sunday afternoon. I wasn’t sure we were going to make that Saturday night. Charlie did not have a good night, and he seemed to very weak, so weak that when I asked if he wanted to go outside, he barely moved. I slept - not really, I just laid on the floor without being able to close my eyes - and felt his slowing heartbeat while listening to his breathing. Around 4 a.m., Charlie popped up, and we went outside. As we made the final turn, and were a few blocks from home, Charlie began to slow down. I don’t think it was because he was tiring - the dog would have probably walked another hour at least - but he didn’t want to go home, he didn’t want this to end. But we made our way back to our home. When we crossed the last street, and were on the last block, I took the leash off. Now on all previous walks, he would usually dart ahead, hoping to catch an unsuspecting squirrel off guard, or buzz through the neighbor’s yard, or just feel what it was like to be untethered. Not this time, however. We walked side-by-side for the last block, and then he led me around the house to the backyard. He had stopped at some fountains during the walk, just straining at attempts to drink from them. I had told him that I would give him a drink when we got back. We had made our way to the hose when the veterinarian arrived. I said that I needed to give him a drink first, and then we made our way to the center of the backyard, the sun just coating the yard in warmth. I was warned that he may yelp from the first shot, but Charlie didn’t react at all as I held him. We walked a very short distance, then we both sat down, and I held him against me, and felt him lean into me. Feeling him lose conciousness, I lowered him to the ground, and he laid in the sun, something he loved to do. I regret not holding him just a little bit longer. The moments after that don’t seem real yet. He had been with us for more than nine years, had been there for so much, and when the vet said he was gone, I was just filled with so much regret. Regret that we didn’t do more, go to more beaches and parks, didn’t play the games he liked, didn’t go for more walks. As he went to sleep, I told him that he was a good puppy, something that always got a tail wag. Soon after he passed, I undid his collar. That collar - his third - was just so meaningful to him. Every time he would get a bath (he was so good at taking baths) we would let him outside, and he would run around like a crazy dog. He always got excited, however, when his collar was being put back on. When I loaded him into the truck as he was going to leave me forever, I leaned in and told him thank you. I was a blubbering mess who could say very little without crying for the rest of the day. I would rather have gone into a dark corner than be out in the world. So many memories poured into my head - popping from behind a curtain to stare out the window when we came home, stealing gloves off our hands and then prancing around the yard with them in his mouth. I especially cried when I watched Renee sing, not once, but twice, about dogs in the final show of the Lancaster Community Players hours after Charlie left us. I do not know how she could act out walking a dog and not break out in tears. We did later that night many times, remembering all the special moments we had with him.